Located in the historic northern New Mexico community of Las Vegas, with several additional branch campuses, Highlands University provides both a rich liberal arts education and comprehensive programs in business, education, engineering, and social work for about 3,450 students. For a cultural bonanza, check out the town's Santa Fe Trails Heritage Days in May. What are the top 3 reasons someone should attend New Mexico Highlands University? The top 3 reasons for someone to attend Highlands is affordability, small campus and a close knit community. What is a typical New Mexico Highlands University student like? Describe the type of person that should attend New Mexico Highlands University. A person who is a self starter, out spoken, determined, and focused person is the ideal student for Highlands. 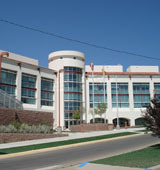 For more than a century, New Mexico Highlands University has served as a leading academic, cultural and economic institution for the communities of Northern New Mexico. Entering its 118th year, NMHU continues its historic mission on its main campus in Las Vegas and centers in Farmington, Roswell, EspaÃ±ola/Santa Fe, Rio Rancho/Albuquerque and Raton. Visit us today and find out why Highlands is the college for your future. What are the top 3 things that students do for fun at New Mexico Highlands University? The top 3 things that students do for fun at Highlands University is to go to hot springs, hang out around campus and watch sporting events. Campus housing is available for undergraduates. Housing deposit : $100.00. Housing deposit is partially refunded if student does not enroll.. Freshman allowed to have car. No pets. 43% of students graduated in the top half of their class. The average student pays $10,109 for tuition, fees, and other expenses, after grants and scholarships. Total stated tuition is $2,918, in-state and on-campus, before financial aid. Learn more about financial aid at http://www.nmhu.edu. Estimate the net price for you at http://www.collegeportraits.org/nm/nmhu/estimator. New Mexico Highlands University participates in the NCAA Division II for college athletics. Want more info about New Mexico Highlands University? Get free advice from education experts and Noodle community members.